Does Google Violate Its 'Don't Be Evil' Motto? As Internet search engine Google has exploded in popularity — adding new applications all the time — it also has sparked concerns about privacy, security and censorship online. A group of experts recently debated Google's merits and flaws in an Intelligence Squared U.S. debate. 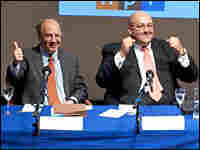 The panelists react to the results of the audience's vote after the debate. On Dec. 2, panelists debate the proposition "Bush 43 Is The Worst President Of The Last 50 Years." As Internet search engine Google has exploded in popularity — adding new applications all the time — it also has sparked concerns about privacy, security and censorship online. The company's motto is "Don't Be Evil," but is Google living up to it? 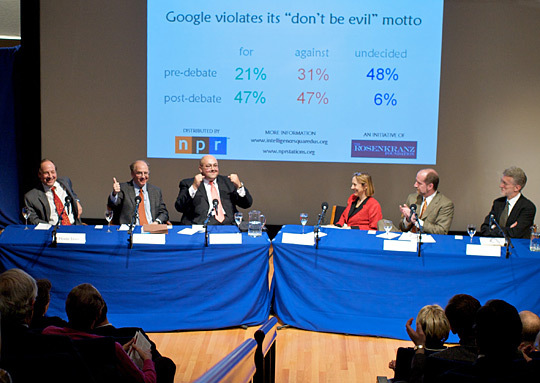 Recently, a panel of six experts debated the proposition "Google Violates Its 'Don't Be Evil' Motto" at an Intelligence Squared U.S. debate in New York City. The series pits experts on either side of an issue against each other in an Oxford-style debate. An audience at Rockefeller University's Caspary Auditorium voted 21 percent for the motion and 31 percent against at the beginning of the Nov. 18 debate. Almost half, 48 percent, were undecided. By the end of the debate, moderated by John Donvan of ABC News, the audience was split, with 47 percent voting in favor of the motion "Google Violates Its 'Don't Be Evil' Motto" and 47 percent against. Six percent remained undecided. Harry Lewis, former dean of Harvard College and Harvard's Gordon McKay professor of computer science. Randal C. Picker, the Paul H. and Theo Leffmann professor of commercial law at the University of Chicago Law School and senior fellow at the university's Computation Institute and at Argonne National Laboratory. Siva Vaidhyanathan, a cultural historian and media scholar who teaches media studies and law at the University of Virginia and writes The Googlization of Everything blog. Esther Dyson, the author of Release 2.0: A Design for Living in the Digital Age and an investor in and director of 23andMe, a gene-testing service, and Yandex, Russia's leading search engine. Jim Harper, director of information policy studies at the Cato Institute and a nationally recognized expert on privacy, Internet and technology policy. Jeff Jarvis, the creator of Entertainment Weekly, who writes about media and technology on his blog, BuzzMachine, and is writing a book entitled WWGD? : What Would Google Do? The Intelligence Squared U.S. series is produced in New York City by The Rosenkranz Foundation.